In the middle of three days off (including Saturday) and having a great time. Went to see The Hoosiers on Wednesday night at Rivermead in Reading with Catrina and the boys. The Hoosiers lead singer, Irwin Sparkes, was in the Kerith youth group many years ago when Catrina and I were helping to lead it. I love seeing live music and they were a great example of live music at its best! The went off to Chessington World of Adventures yesterday, going swimming with the family a bit later today, then off with the boys to see the new James Bond film tonight. It's been so relaxing I even found time to chop some logs yesterday (my wood splitting axe is the best tool in the world) and light the fire in our living room for the first time in ages. Hope to catch you all Sunday morning for the next bit of on rebuilding the walls. Listen to it on the podcast if you miss it. For those not in the adult meeting last Sunday morning I talked about Nehemiah and the rebuilding of the walls of Jerusalem in 52 days. The challenge for the community then was for everyone, whether they were a goldsmith, a perfume maker or a bunch of daughters to spend 52 days doing wall building. My application was that we're going to spend 52 Sundays next year rebuilding a wall as we go to three main meetings on a Sunday, in order for us to have space to grow. For that to happen we're going to need a whole host of new volunteers (somewhere around 150) to commit to doing whatever it takes to build the wall. I'm not actually asking anyone to do all 52 Sundays - that would be madness! Just so you know I'm committing to being in all three meetings for 40 Sundays next year, but I'm not expecting anyone not on the paid staff (and so not able to take time to recover during the week) to do more than 26 Sundays. So if you're not currently serving at all maybe you could consider serving for 13 Sundays next year. Or perhaps if you currently serve 13 times a year you could give another 13 slots (but don't stop doing what you're currently doing, or I'll have lots of very irate ministry heads contacting me!). At the end of 2009 I promise we'll give everyone who's signed up for this the option to stop, with no guilt attached. 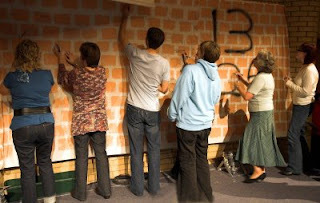 So on Sunday I asked anyone who would commit to doing 13 or 26 Sundays next year to symbolically write their names on the wall we had on the platform, and also to write on the wall the name of somebody who they'd like to become part of our community during 2009 as a result of the space we are creating for people to come. It was very moving to see so many names being written, and there was a real sense that as a community we can do this thing. We also had volunteer forms for people to fill in to say where they'd like to serve. I spoke yesterday to Sue Ranger who is now processing all those forms, and she was so encouraged that lots of people, rather than giving a specific ministry area just said they were willing to serve anywhere in any of the meetings. That's so much the spirit that Nehemiah and the people had as they rebuilt the wall - just whatever it takes. 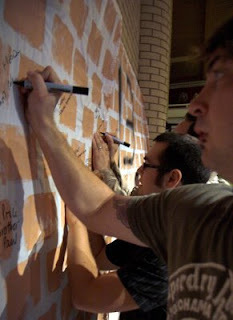 I'm going to be preaching some more on the wall on Sunday morning, and there will be more opportunities to sign up and fill in a volunteer form, as we still need lots more people. I've included some photos so those of you not there can get a feel for what went on. Whenever I blog on a Monday I always feel like there's so much stuff that has happened over the weekend that I'm never sure what to talk about and what to leave out. It's a real dilemma as I don't want to bore you all with a long list of things you might not be interested in, but at the same time I realise I get to hear about loads of exciting things that you might never get to hear about. So for this week at least I'm going to mention briefly everything I'm aware of that went on this weekend. Respite Club - Two Saturdays every month we run a respite club in K2 where families who have children with special needs can have them looked after in a fun, loving, caring environment while they get a break. This is just part of our special needs ministry which is ever growing and of which I'm incredibly proud. Ethos on Tour - Our Youth band 'Ethos' were down in Hereford this weekend playing at a Hope08 Youth Event on Saturday night and a churches together joint service on Sunday morning. 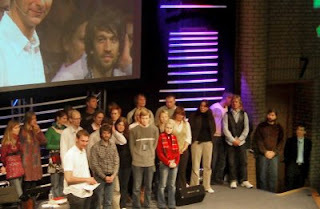 Lee (our Youth Pastor) went with them and spoke at both events, seeing 8 first time commitments over the weekend. We're believing for Ethos to have a growing ministry serving the wider church and they're already playing at the NewFrontiers Butlins event in January and have an invite to go to Lithuania and play at a youth event there too. 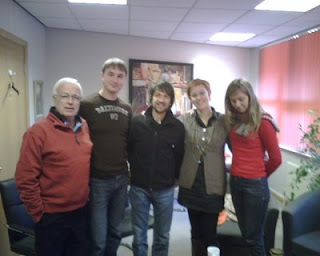 As an indication of their commitment Lee and Ethos were back to run our youth meeting on Sunday night. Ben Davies on Tour - Ben and Mo were in Cyprus last weekend doing a series of meetings for a church over there. Ben is having increasing impact nationally and internationally and is also going to Poland And Lithuania before the end of the year. Just so you know Ken Bothamley also going to Lithuania with Ben, and will be visiting the Balkans again before 2008 is out. Alpha Day Away - This was held on Saturday at Tony and Liz Pudner's House. I spoke at the first session where there was just such a great buzz amongst the guests. I had to leave after that but Ken and Karen Jones who were leading the day said the buzz just grew and God was powerfully at work in the lives of the guests - more to come of this I'm sure. Skydiving - On Saturday morning Ruth Jackson, Lisa Rutland and Iris Joyce went skydiving to raise money for CAP. Mad or what! I'm sure it's not too late to sponsor them if you want to - just get in contact with them. Wedding - On Saturday afternoon I did the wedding at The Kerith Centre of a girl who isn't a christian, but who works as a helper in our respite club, and her partner. It's really interesting that she considers herself to be part of our community and so wanted us to marry them, and it was a real privilege for us to be able to serve them in this way. Very few of the guests had ever been in The Kerith Centre before so it was fascinating to chat to them and hear their comments on what went on - very peachy! 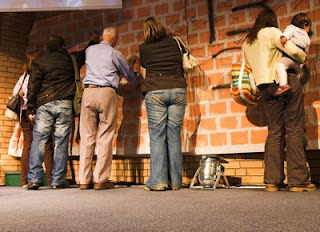 Sunday Meetings - I'll write a separate blog about "The Wall" on Sunday morning, but suffice to say for now I was thrilled by peoples response to stepping up as a community to making our three main meetings in January happen. I haven't heard what the total offering for Serenje was yet, but I do know that the 5-11's raised £150 in their bring and buy sale for Serenje which was brilliant. Hearing Catherine Rohr again on Sunday evening was great too. I'm sure there's stuff I've missed, so add comments to fill us in on anything else you are aware of. We're hosting a South of England CAP Pastors Conference tomorrow (Tuesday) which I'll be attending, then I'm taking Thursday and Friday off to spend some time with the family. Those who made it to the Willow GLS (Global Leadership Summit) will remember a guy called Gabriel from Nigeria. I got him on the platform when we talked about the offering to allow GLS's to run in countries, like Nigeria, which wouldn't be able to afford to fund them simply from the registration fees as we do in the UK. Gabriel's GLS was being funded by a church in Cincinnati in the US, and Kent, one of the pastors from the church in Cincinnati, had come over with Gabriel to see how we ran it all. Well we just got an email from Gabriel to let us know how it all went, which I've included below. Talking of the Summit this Sunday night we're showing the talk a lady called Catherine Rohr did at there this year. I've now seen it once live and four times on DVD and can't wait to see it again - it's that powerful. Get there to see it if you possibly can! Also don't forget the second week of the Serenje offering this weekend. As Catherine Rohr prays "Bring it on God.....". The GLS in Jos was, to the glory of God, successful! By 3 days to the Summit, our Registration was about 900. This scared us not to go on Radio and TV, so we do not have Seating crisis. Yet we realised that doing so would have served as Reminder to many delegates who were selected/nominated by Heads of their Church Denominations. Attendance first day was around 550 and second day around 650. The Speakers were well received and we have continued to receive positive feedback of how a blessing it was to those who attended. 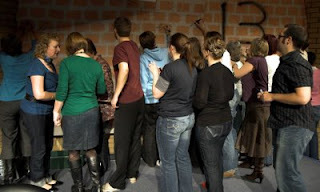 My time with you at Bracknell was so valuable as it gave me a good picture of how the GLS runs. Willow sent a volunteer Technical person with a good Projector. He arrived in Jos, along with 2 officials from Kent's Church, on the 14th October. We had time to go over issues peculiar to our Location and God helped us such that at the end we made just a few learning mistakes. Thanks for your support and prayers. Our God will continue to be glorified in our labor of love for His Kingdom sake. Please extend my personal appreciation to Pastor Simon. 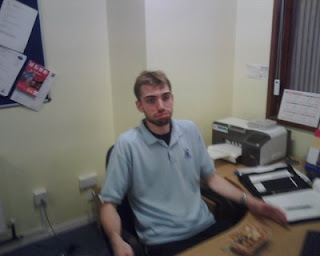 Blog veterans may remember me spending a day at work with Sam Fairs-Billam and seeing his work with the homeless. Well today I've come to Bracknell Leisure Centre with Ed Campbell who works there for "The Well-Being & Leisure Team". This team helps people with learning disabilities to make use of all the mainstream leisure facilities in Bracknell. They get to do everything from swimming and badminton to snooker and golf. I got to take part in a fitness session to music on exercise bikes (I kid you not) and a dancing keep fit class! My cycling was considerably better than my dancing. It was so cool to see the great stuff Ed is doing, and the passion he does it with. A number of the people in the two classes I went to also go to Hilltop, our church group for adults with learning disabilities, and it was really good to see them too. Their dancing was much better than mine! If anyone else fancies having me visit their work just let me know! Andy Jackson has done it again - this time appearing on the Radio 4 programme "You and Yours" to talk about the impact of the credit crunch. Apparently over 1 million people listen to it daily - even more people than have tuned in to listen to me on Radio Berkshire :-) Not that I'm competitive or anything! Andy did a great job - you can listen to an archive recording here. Radio 1 and the Chris Moyles show must be next on Andy's list! That gives us a grand total of £36,809, which is fantastic. Gift Aid needs to be added to that which should take it over £40,000, but we still need in the order of £60,000 this weekend to meet our target of £100,000. So for those of us still to give let's be praying and asking God what we should give this weekend. I have a deep confidence in us as a community, that even in the current economic turmoil we will give beyond ourselves and reach our target. It's just so exciting to be on this journey together. That because of what we're doing children who would have been deprived an education will instead get through secondary school and then go on to train as doctors, nurses, school teachers, politicians, business leaders and church leaders. That parents who would have died young because they weren't able to take their ARVs and didn't have enough food will live into old age and get to see their children grow up, get married and have children themselves. And that a whole community will be given hope and a future because we chose to give. Just walking to The Kerith Centre after dropping off Alice at school and it's such a beautiful, crisp sunny morning. Why not just take a few moments today to stop, go outside and contemplate this amazing world we've been given to live in. Catrina and I always knew that this was going to be a crazy year, so at the start of it we sat down and planned to have a couple of weekends away with just the two of us. This weekend we had the second of those weekends, and just had a fantastic time together. I love my wife! We're now planning our diary for 2009 - romantic weekends away will be high on the list of first things to go in there! From what I've heard it sounds like a good time was had in Bracknell too. I'm in the middle of listening to Lee's preach from Sunday morning, it sounds like both Lee and Zoe did a great job speaking on Sunday. I also hear there were over 180 people from more than 60 churches at the CAP Money training course we hosted on Saturday - it's great to be in partnership with the CAP guys - their success is our success. Let's just hope Newcastle can beat Man City tonight, and then my weekend will be complete! Ben and I met today with Tebogo Mulaudzi from Soweto, who many of you will remember from previous times he's been over here and preached with us. 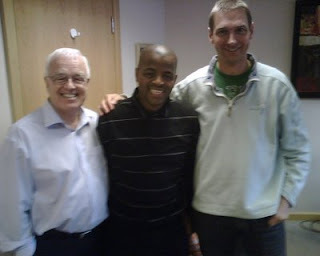 Tebogo is in the UK for some rest and relaxation - perhaps I need to go and spend some time in Soweto! A reminder that we're meeting as a church to pray tonight and tomorrow night. As a community we're doing loads of stuff to create space for God to move, but we know that at the end of the day it's only God who can change lives - "I planted the seed, Apollos watered it, but God made it grow". Just heard that three ladies made first time commitments this week at Sparklers (our Mums and Toddlers group). Well done to Dany and the team for their planting and watering, and thanks to God for breaking in and causing the growth. 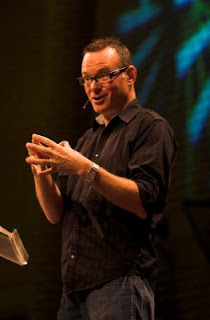 A great photo of John Kirkby speaking on Sunday morning. I was so gutted to miss it, but have heard from everyone how well he spoke. People also said how well it fitted into the Money series we're in and as preparation for the next two weekends Serenje offering. Please be thinking about what you're going to give towards our target of raising £100,000 to cover the costs of the first year of this project. I also heard the drama on Sunday morning was very good. 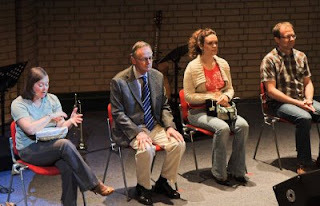 I thought you might like this photo of some of our great drama team in action. I'm so excited by the opportunity these three meetings are going to give us to grow. I realise that there is still lots of detail to be worked out, but we've got a great team working on how having done the fire bit we now do the aim! I'm going to speak on the morning of 26th October on Nehemiah rebuilding the walls and what we can learn from that about the journey we're on. Why not start reading it in advance of the 26th. It's been such a privilege to have 2 days away with some of the staff. We did quite a bit of planning for our 3 meetings in January, looked at the talk Craig Groeschel did on IT at the Summit and just enjoyed being together. We also watched the film crew I mentioned yesterday at work which was fascinating. Their attention to detail is quite incredible and a real challenge to me as we look to do more media stuff. There must have been 100 people there when I went for a run at 7.30 this morning and they were telling us this is a low budget movie! The film is going to be released next June, is about Charles Darwin, stars Paul Bethany and will be released next June. They wouldn't let us be extras though! Tonight I've been karting in Milton Keynes with some guys from the company I work for. Great fun but my arms really hurt now! I've come away with some of the staff team for two days at Waverley Abbey, creating a bit of headroom for us all to take stock of Willow and think about what we do with it all. 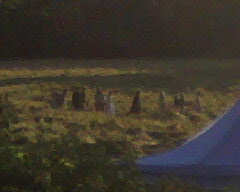 The photo probably isn't very clear but there is a film crew here making a film about the life of Charles Darwin. 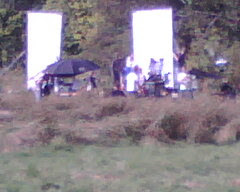 They're filming a scene where Charles Darwin and a load of children run towards a lake. Not exactly Indiana Jones but watching it has kept all of us amused - it doesn't take much! Talking of Charles Darwin we'll be looking at evolution versus creation next year. Perhaps we'll show some of this film! 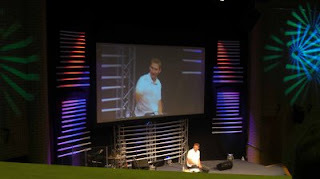 I turned up at The Kerith Centre at 7.30 am on Friday and Saturday and 8.30 on Sunday, each time to be greeted by hordes of people who were already there to make the conference and our Sunday gatherings happen. And the vast majority of those people were volunteers. They hadn't got out of bed that early because someone had paid them to do it, but simply because God has given them a heart to serve. I can't tell you what it means to me to be part of a community like that. To see young and old, black and white, rich and poor serving alongside one another is what church is all about. If you were one of those people then thank you so much. Please know that what you do is so appreciated. Keep connecting with God in prayer throughout the day as Ben reminded us on Sunday night. 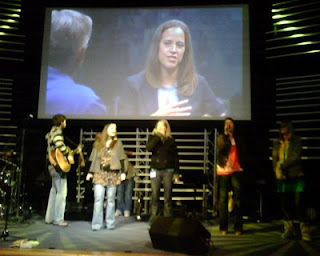 Well it's 7.45 on day the morning of day 2 of the Willow Leadership Summit - the photo is of the band doing the sound check for today. I love being part of this conference for so many reasons. The quality of the speakers. The incredible serving heart of our people - I'm so proud of everyone involved! God speaking so clearly. Our fantastic singers, musicians and tech team. I went for a meal with the Lithuanians and Albanians and they were just overwhelmed by it all. Our 26 Lithuanian guests all turned up last night and at this moment are visiting the Queen in Windsor! They represent 6 different churches from 3 different cities, although most of them are from the church we first had contact with when some of their ladies came over for the Unique conference. This morning I met with Saul who leads that church along with 3 other key leaders, Ben Davies and Ken Bothamley to talk about next steps in our relationship. It looks like Ben is going to go over and do a leaders weekend for them in early December which will be exciting. The Kerith Centre is buzzing this morning with people setting up for the conference. I've come home to watch some of the DVDs as I'm hosting it all. The concept of having 'headroom' in our lives seems to have provoked quite a bit of discussion, and in particular caused people to ask how we create headroom, not only in our finances but in other areas of our lives such as in our busy, busy schedules. Catrina has even taking to send me texts with the single word "Headroom" in them, encouraging me to stop what I'm doing and relax! We're going to spend the next Church Vision Night (12th October - 6pm for coffee and cakes) looking at "Creating Headroom" in church life in 2009, as well as talking about our Christmas plans - don't miss it! Anyway, Alan Lander (one of our elders) sent me a link to some great guides on creating financial headroom in our lives from a Christian organization called Credit Action. The man behind Credit Action is Keith Tondeur who is highly respected in money circles and his views are often sought by Government. I've used some of his books in preparing some of the current money series - they're very good and are available at our bookshop. Anyway, on the Credit Action website there are some very readable and practical money help guides in their 'Better Money Management' series including specific guides for single parents, students and a helpful one on pocket money. I'd also highly recommend the CAP money course which is transforming how Catrina and I are making headroom in our finances. We've never been great at budgeting - if you're the same then book yourself in for the next course which starts on Tuesday 14th October. Off in a bit to see the Lithuanians who are apparently now in the UK and on their way to sunny Bracknell! I thought you might enjoy this video on the New York Times website of our good friend Andrew White doing his stuff in Iraq - very moving. We must always be a people who think globally but act locally. To that extent it's so exciting to be associated with people like Andrew, and that this afternoon the 26 Lithuanian Pastors who are coming over for the Willow conference are turning up. If you see any of them at the conference or on Sunday (they'll probably be hard to miss! ), or the Poles, Albanians, Nigerians or Americans who are coming too then be sure to let them know how pleased we are to have them with us. Hope to catch you at the conference on Friday or Saturday.